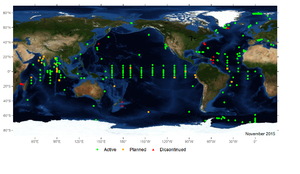 OceanSITES is a worldwide system of long-term, open-ocean reference stations measuring dozens of variables and monitoring the full depth of the ocean from air-sea interactions down to the seafloor. It is a network of stations or observatories measuring many aspects of the ocean's surface and water column using, where possible, automated systems with advanced sensors and telecommunications systems, yielding high time resolution, often in real-time, while building a long record. Observations cover meteorology, physical oceanography, transport of water, biogeochemistry, and parameters relevant to the carbon cycle, ocean acidification, the ecosystem, and geophysics.